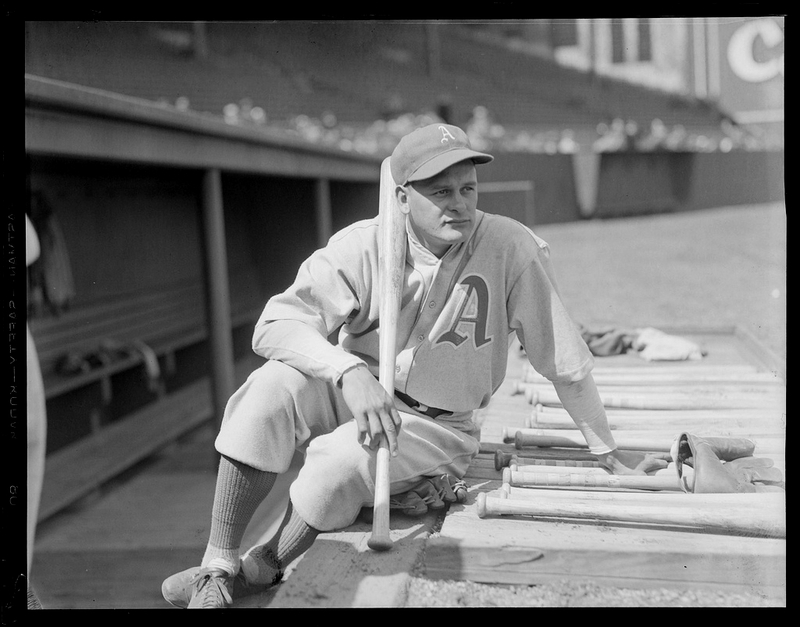 The Philadelphia Athletics’ Bob Johnson relaxes before a game at Fenway Park in the mid-1930’s, courtesy of the great Leslie Jones. Nicknamed “Indian Bob” in those pre-PC days as he was 1/4 Cherokee (and interestingly born on an Indian reservation in Oklahoma before it was a state), Johnson was a bonafide star who toiled in relative obscurity as most of his career was with the usually hapless Athletics – he arrived in 1933 just when Connie Mack was selling off many of his stars to remain solvent in the Depression – and in 8 of his 10 years with Philadelphia, they finished either last, or next to last. This was no fault of Johnson himself, who was an 6-time All-Star with the A’s (8 overall). He was great right out the gate in that rookie season of ’33 with a line of 21/93/.290 and second in the AL with 44 doubles, but continued to remain consistently among the top hitters in the AL; he was only the 5th player in history to have 9 straight 20+ HR seasons (after Ruth, Gehrig, Ott and Foxx), and knocked in over 100 runs in 6 seasons in a row. 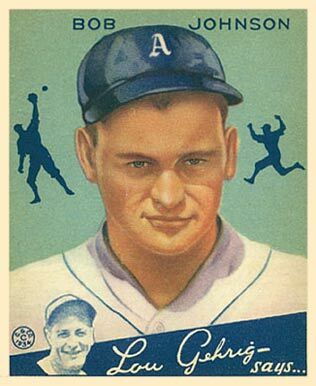 He finished strong as well – after leaving the A’s with a stopover in Washington he had a stellar season for the Red Sox in 1944, leading the league in OBP (.431) and finishing second in the AL in both RBI and runs and third in BA, at age 38. He retired after the 1945 season with a career BA of .296. Bob finished his A’s career near the top in most franchise offensive categories. He was certainly one of the bright spots for fans in a discouraging era for the Athletics, and he is so honored with a place on the Philadelphia Wall of Fame at Citizens Bank Park.